I was smart this time and did our little photo shoot while big brother was sleeping. I think Griffin appreciated not having to worry about being sat on while his mama was taking pictures. You are definitely trying to keep up with your "big" brother. At your two month appointment you weighed 14 pounds, 10 ounces and were 23.5 inches long. You eat every 2 to 3 hours which feels like ALL THE TIME. But you are a growing boy, right? Hungry boys will probably be the story of my life. I'm good with that. I just might need to learn to cook in larger quantities. We haven't quite gotten into a sleeping schedule yet. You are pretty predictable during the day...eat, play, sleep. You even usually take a longer nap during Levi's nap time. You must know your mama needs a little break. Thank you sweet baby. Your nights are not so predictable though. You are waking up 1-2 times a night...and I never know when that will be. Lately you have been going to bed between 10 and 11pm, waking up between 2 and 5am, and then going back to sleep until 7 or 8am. You usually go right back to sleep though, so I won't complain. Tiredness is just part of being a mama...and it is so worth it! You are such a sweet little boy...the perfect addition to our family. At two months we all love you so much! You can see Griffin's one month pictures here. Thanksgiving is over and Christmas lists and plans are already spinning through my head. No black Friday shopping for me yesterday. Joel was working and I stayed home with the little boys. I did shop online though and scored some great deals. I actually got quite a bit of Christmas shopping done. Yay! I hate to admit that before they were born I was praying for both of these sweet little boys to be girls. I had no idea that I needed boys in my life. Only God knew that. What a precious gift these boys are. What a privilege it is to be there mama. I am so thankful that the Lord entrusted me with the two of them. I have longed to see my kids together. That is something that I didn't get to experience with Cora and Levi. I can't describe how amazing it is to watch the bond begin to develop between Levi and Griffin. Of course Levi has his not so nice moments...many times a day. But he loves his little brother so intensely. Just this morning he was yelling from his crib, "Mama, Griffin, Mama, Griffin". I love that he thinks of Griffin right when he wakes up. I am so thankful I can watch the two of them together. The keep me busy. They make me tired. They challenge me to be a better mama. They draw me closer to my Father. They make our house noisy, and messy, and fun. I am so thankful for the two of them. DaySpring also has their big canvas sale going on now. You can get 30% off all canvases...including the new canvases by Jones Design Company. I ordered the Seek First His Kingdom Print. It usually retails for $54.99 but with the 30% off canvas sale you can get it for $38.49...AND if you use the 30% off super sale code you can get it for $26.94! There are lots of other great canvases and tons of other deals. Make sure you check out DaySpring before Monday! My church shared this video at our Thanksgiving Eve service last night. I wanted to share it with you too. As I have been thinking about what it looks like to live out thankfulness in my own life, I went back through this video and wrote down all the things that define thankfulness. I pray that thankfulness would always be the condition of my heart. I was wanting to post this earlier this week but never had time to sit down and blog. So...I wanted to let you know before it is too late that DaySpring's Super Sale is going on right now. This is their biggest sale of the year and there are tons of awesome deals. Use coupon code SUPER30 to get 30% off the entire store. This sale started Tuesday, November 22 and lasts through Monday the 28th (Cyber Monday). You may be heading out way too early on Friday morning to score some Black Friday deals, but not me. The thought of getting less sleep than I already do is not appealing right now! :) So, I am excited to do some shopping from home and not have to go out in the crazy crowds. Not only can you get 30% off the entire DaySpring store, but they are also having Super Specials with huge discounts...I mean really huge discounts ranging from 60% to 75% off! Here are some of my favorites. Aren't those deals amazing? And there are even more. DaySpring also has all their canvases 30% off and their totes are buy one get one free through the end of November. The canvas art by Jones Design Company is my favorite. I just ordered mine and can't wait to get it. These would make some great Christmas gifts too. And don't forget the cards...DaySpring cards are the best. Keep checking back...there will be a DaySpring giveaway here at The Macs in the near future! Happy shopping...and more importantly, I hope you all have a wonderful Thanksgiving. What better way to start off the week then with a few more sock monkey pictures? It has been getting cold here, so we have needed our sock monkey hats to keep warm. You all rocked the comments during giveaway week. Wow! I don't think I have ever had over 600 comments on a giveaway before. So fun. We are just sad that we can only pick a few winners. We would send you each one of everything if we could. Really, we would. Levi thinks every little boy needs a sock monkey hat. But, if you are one of the winners...your Monday will be even better! Tara - My girlies are very into Dr. Seuss so 'How the Grinch Stole Christmas' is very popular in our house! Melissa - I LOVED The Velveteen Rabbit when I was little! Amee - Hi! 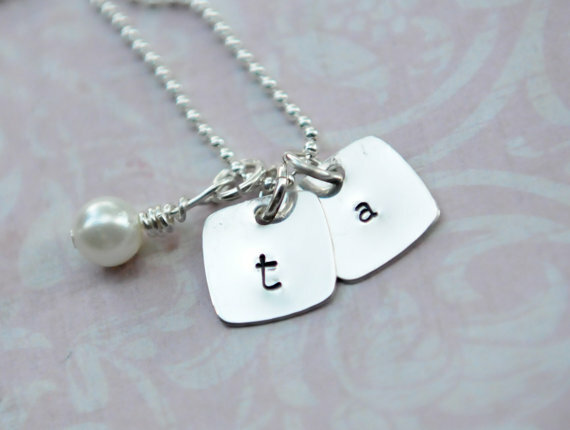 My favorite is the Hand Stamped Sterling Silver Heart on a Chain with a Pearl - Whimsy Heart. 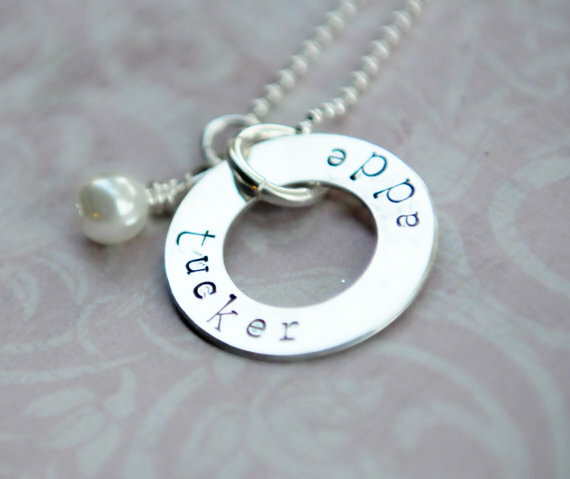 I would give this to my future daughter in law on Dec. 31st, as she is to wed my oldest son. :) I would put her new intials SME. Thank you for hosting this give away! I love your bracelets too! 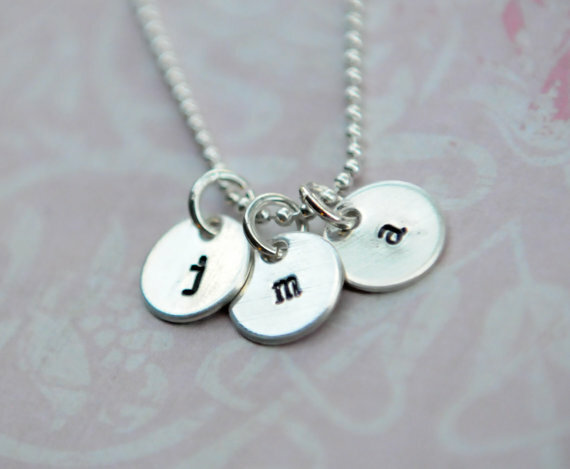 Beautiful sentimental jewelry. Lindsay Jo - i'm loving the rudolph one! Tiffany - I'd give it to my sweet 12 week old, Graham! Then i would have to find one for my 21 month old. The hats are precious and so are your boys. Angela - I would adore the quatrefoil plate in turqoise and red! Thank you. Griffin is absolutely precious. Congratulations!!! Rachel is offering my readers 15% off any order using code MACS15. Coupon good through November 30th. All orders need to be placed by November 30th to arrive by Christmas. Karen is offering my readers 20% off any order using code griffin20. You can get free shipping on orders of $50 or more through December 10th. Enter coupon code FREESHIP at checkout. Levi and I LOVE to read. One of the best things about being a kindergarten teacher (besides the kids of course) was all the books I got to read everyday. I have always loved children's books. I'm sure in a few weeks he will have a new list of favorites. Last week we were given two new books. How exciting! The author of these books, Mary Ellen Tippin, is a friend of my family. In fact my family was introduced to the Tippins when we first moved to the area many, many years ago. Mary Ellen and my mom have been best buddies ever since. These two books are about three little birds--Flitty, Twitty, and Itty Bitty--and their birdie family. They are a little long for Levi's age, but I was actually surprised how they held his attention. I only had to paraphrase a few pages because he was ready to move on. :) He loved the birdies and was always looking for the nest in the illustrations. 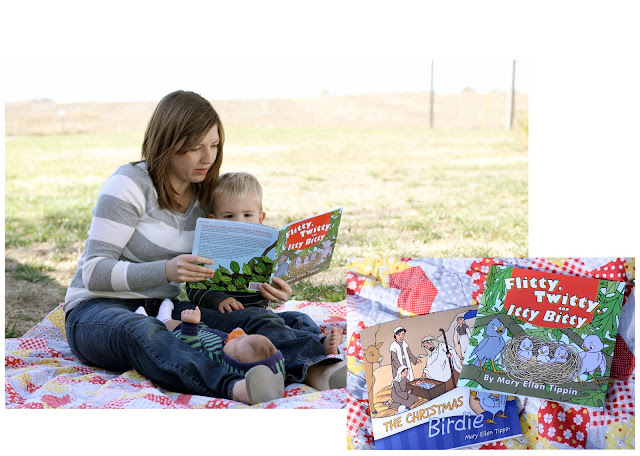 My nephew and niece are almost 3 and 5 and they love these books. They ask to read them whenever they go to Grammy's house. I think in a few months Levi will love them too...maybe they will even make his list of favorites. Not one little birdie will fall to the ground without your Heavenly Father knowing all about it. So why should you be afraid? You are even more valuable to God then birdies. I have been on the search for some Christmas books to read to Levi and Griffin that talk about the real meaning of Christmas. I would love to have a stack of Christmas books that we pull out every year to read. The Christmas Birdie is the perfect addition. 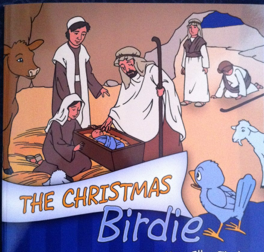 What a fun way to recall that most important day of Jesus' birth through the eyes of a little birdie. 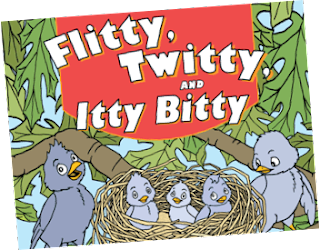 Mary Ellen is giving away TWO sets of her books along with an audio CD of Flitty, Twitty, and Itty Bitty (there is also a birdie song and bonus story included on the CD). You can find out more about Mary Ellen and her books on her website. These books are available for purchase on the website or through Amazon. To enter the RV Parties giveaway click here. 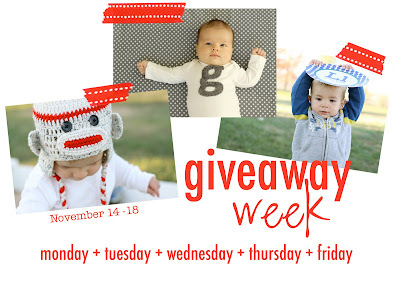 To enter the Sock Monkey Hat giveaway click here. To enter the A Perfect Treasure giveaway click here. To enter the ImBlessed giveaway click here. All giveaways close Saturday (tomorrow), November 19th at 9pm. I have always loved silver bracelets. I wore one all the time that Joel gave me while we were dating until it broke. I was so sad. Now I wear three...I think I could even wear more! 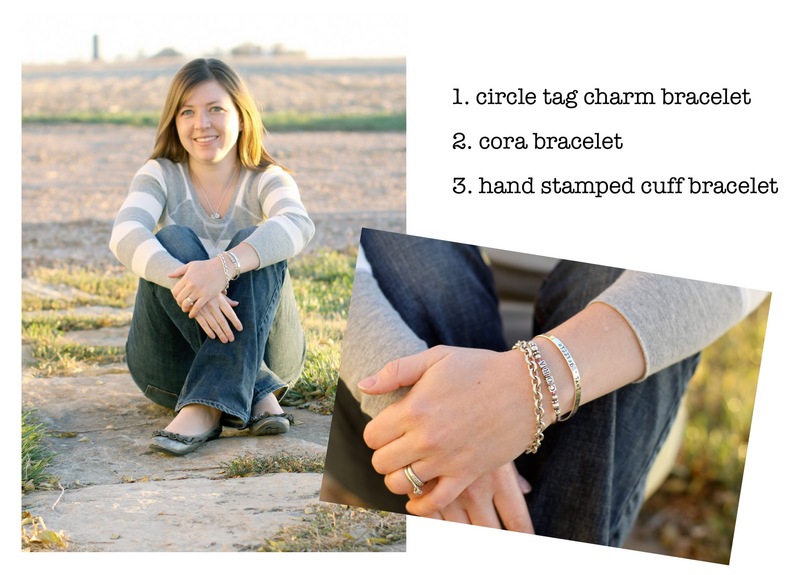 I wear a circle tag charm bracelet that my parents gave me on my wedding day. They engraved it with my new initials JCM. Did you know that my middle name is Cora? I have always loved my middle name, but after losing our sweet Cora I love that it is my middle name even more. I also wear a Cora bracelet. A sweet lady who owned a local jewelry store in my town (it is now closed) made one for me and many others when Cora died. We all wore them to the funeral. And I have worn mine almost every day since. And now I have a new bracelet! Misty from ImBlessed sent me a hand stamped cuff bracelet after Griffin was born. Now I have a bracelet with all of my babies names. Love it. When I am out with my family people always assume I am a mama of two boys. Cora is not a visible part of our family anymore. Sometimes that is still so hard. 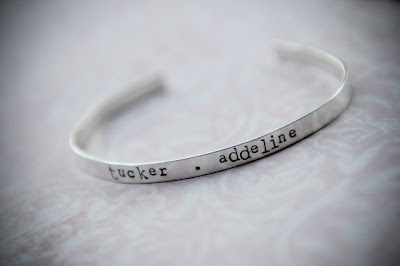 So, I love wearing this bracelet as a reminder that I am a mama of three kids...one girl and two boys. My sweet girl isn't with me, but she is waiting for me in heaven. In some ways it is a reminder that this world is not my home...to always keep an eternal perspective. I love that. Misty from ImBlessed is giving away a $30 gift certificate to her shop to one of my readers. Now you can have a piece of your very own hand stamped jewelry...or maybe there is someone on your Christmas list who would love a new necklace or bracelet! come back and leave a comment telling me your favorite item. You can find ImBlessed on Etsy. All giveaways close Saturday, November 19th at 9pm.